Also available on Amazon Kindle here! 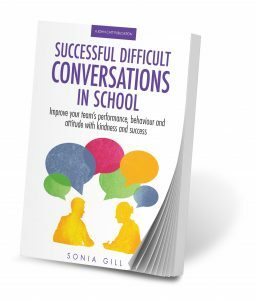 My 2018 book, Successful Difficult Conversations in Schools is available in paperback and on Amazon kindle. Do you feel you’re struggling to get your message across, or that your words are not having the desired effect? Then this book is for you. Rooted in solid theory and based on experience, this book will help you have more effective conversations when talking about the ‘tricky stuff’ in school. Whether with colleagues or parents, the practical advice and simple tools will help make those inevitable conversations easier.